2. Cut top of peppers and remove the internal ribs. 3. Cook garlic/onions over medium heat until begin to soften. 5. When beef begins to brown, add the remaining ingredients (except the peppers). 6. 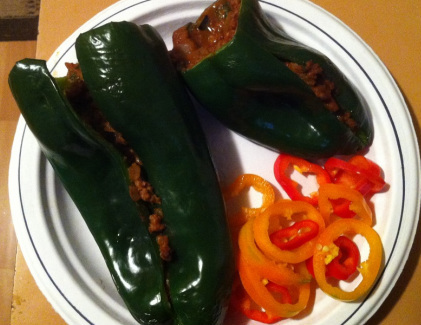 When meat is cooked, stuff peppers with meat mixture and place in oven for 20-25 mins.